There’s no doubt about it – conferences are often the place where you encounter those rare yet crucial make-it or break-it opportunities. Many people feel that it is where the most important part of the work gets done and in general, you can usually feel a special energetic vibe in the atmosphere that’s coming from lots of people trying to connect and learn from each other. There’s a magical hype in the air, as you struggle to arrange your booth to your satisfaction, attract visitors, give out flyers, check out competition or interesting, up-coming trends and meet up with the right people, all at once. And if you’re lucky and things start to go your way, maybe you’ll come home with an interesting proposition, with a great new idea or with a whole bunch of new clients. 1) One of the main goals most businesses have at a conference is to generate leads. Convincing people to take that extra step from passive listener to active participant is often a tricky and delicate business. Visual QR Codes can help you smooth the path by offering passer-bys an innovative and fun option to learn more about your business in an easy, no-commitment kind of way which can offer a slick online flow process for leaving contact details. 2) Sometimes keeping track of leads and keeping the engagement channel open is just as difficult as generating interest can be. One of the great ways you can keep track of your leads is to use a Form QR Code on your conference flyer. That way each person who scans your code will answer a form which will be sent to your email, ensuring that you receive their details in an easy, organized manner. 3) Don’t be dull! 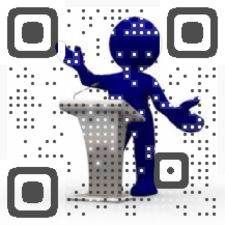 Captivate your audience with a Visual vCard QR Code which you can offer on your business card each time somebody asks to exchange details. Your innovative vCard will add an unforgettable element to your business and your contact details will automatically be saved into their device, saving them the hassle of saving your business card.